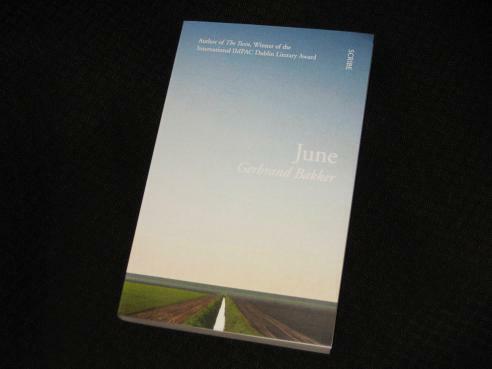 The latest of Bakker’s books to make it into English is June (translated by David Colmer, review copy courtesy of Scribe Publications). It starts in 1969 with a royal visit, the Dutch Queen visiting small towns and villages in a rural area to get close to her people. As one of the visits draws to a close, a woman comes hurrying up with her child, just in time to see the Queen before she leaves. There’s a touch on the cheek, a photograph and – much later – a sobering end to the day. In June, the attentive reader will find definite echoes of Bakker’s other novels. The country setting, with its wide-open spaces and isolated towns is reminiscent of the landscape of The Twin, while the background spite and repressed anger of both the previous books are evident here as well. This is a novel where little happens, but anything might; it’s all about what’s going on beneath the surface. The forty years since the Queen’s visit have not been kind to anyone, and there’s a palpable sense of an end of an era. The once bustling farm has been reduced to an old duck and one fed-up bull; the trees are beginning to sicken, needing to be felled. Even the house itself seems to be on its last legs, with missing tiles, balconies on the verge of collapse and cracks suddenly appearing in the windows, brought about by the blistering heat of the day. As the family go about their business, old grudges are recalled and unresolved arguments bubble to the surface. The rain threatening to break the dry spell isn’t the only storm brewing in the distance. The character studies are the strong point of June, with a multitude of viewpoints given in many short chapters. Most of the attention is spent on the Kaan family (old Zeeger and Anna, Klaas and his daughter Dieke, the other sons, Jan and Johan), but there are also several important figures outside the family. The baker, the man who caused the young girl’s death so long ago, is one of them, along with the widow, Dinie Grint, whose son is intimately connected with at least one of the Kaans. The photos and memories they share help us to piece together what actually happened back in 1969. Despite these good points, truth be told, I wouldn’t say the book works overly well. June was actually written before The Detour, and I think it was a wise decision to leave this one for later translation. There’s obviously a lot the writer wants to say, but the reader (or this reader, at least) is never quite sure what the point is, with the book failing to cohere, leaving the impression of a messy tangle of half-developed ideas. It ends well, with a longer section revisiting the past, but it doesn’t quite make up for the slow, meandering middle parts. If you’ve read his other books, though, you’ll probably enjoy this one. It has a similar style, with another excellent translation from Colmer, whose prose catches the tense undercurrents bringing the flaws and idiosyncracies of the minor characters (such as Dinie Grint’s casual, hypocritical racism and homophobia) to the fore, and I’m sure it’ll find its fans. Still, I don’t think this will be bringing more silverware to the Bakker cabinet. In truth, like the storm which never seems to arrive, June just doesn’t quite get where it wants to go.